Choosing the best Disneyland rides for your toddler can be tricky. Finding the ones with no height restrictions is a good start, but it's not enough. A ride with Mr. Toad might seem like a good idea, but you need to know more. Otherwise your two-year-old may burst into tears as your driver Toad is sentenced and takes you along to Hell, complete with fire, demons, and dragons. Or you may be tempted to jump out of your boat and swim for it rather than endure your child's screams and sobs that start during the noisy cannon battle at the beginning of Pirates of the Caribbean ride. To help you choose the best experience for your kid, the rides below are pre-screened. They don't have any scary, dark scenes or make loud noises. The move gently. They're also screened for seating. Where noted with the letters A2K, the ride vehicles have enough room for a reassuring adult and two little ones to sit together. These rides move, but gently, and there aren't any scary moments or sudden surprises. 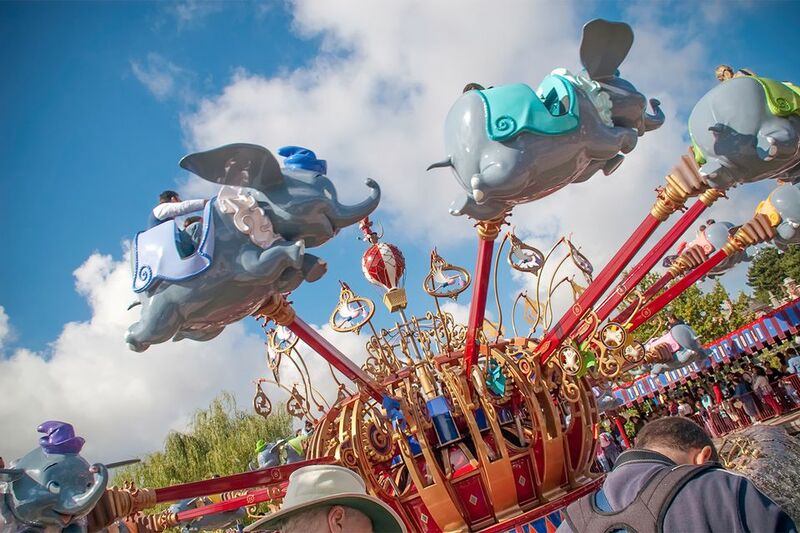 Astro Orbiter: Located in Tomorrowland, it's a little like a space-age version of Dumbo, flying in circles and going up and down, but it's a little taller. Casey Jr. Circus Train: You can board this tiny circus train to go for a ride in Fantasyland. Seating: A2K. Columbia Sailing Ship: Head for Frontierland to take a ride on a tall ship on the Rivers of America. Kids love to pretend they're pirates while riding it. Open seating and the kids can move around on deck. Disneyland Railroad: You’ll find railroad stations near the entrance on Main Street U.S.A., New Orleans Square, near the entrance to Mickey’s Toontown, and in Tomorrowland. The old-fashioned steam train runs all the way around the park, with a short stretch that passes through a dark tunnel. Seating is easy for groups of any size. it's a small world: It may be a small world, but it’s also a little noisy and chaotic — and some children find those singing dolls downright terrifying. Some adults also refuse to ride because they can't get the song out of their heads afterward. There's plenty of room in the ride vehicle’s bench style seats for most families. It’s located near the back of Fantasyland near the Toontown entrance. King Arthur Carrousel: This beautiful carousel is full of galloping horses and suitable for any but the most motion-sickness-prone of kids. It’s in the middle of Fantasyland. Kids ride alone, but their adults can stand next to them. Main Street Vehicles: A ride down Main Street U.S.A. in the double-decker Omnibus, horse-drawn streetcar or fire engine can be good, old-fashioned fun for the kids. You can board near the train station or at the hub in front of the castle. Open seating makes it easy for everyone to stay close together. Mark Twain Riverboat: The Mark Twain is a recreation of an old-fashioned riverboat that sails around Tom Sawyer’s Island, but there's not a lot to do or see. Board it in Frontierland. Kids can move around on the decks. If you’re among the first to board, ask a Cast Member if you can help the captain steer the boat. These are attractions that you and the kids walk through, or sit and watch. If your little ones need to work off some energy, Toontown is an especially good place for that, with most of the walk-through houses and fun things to play with outside on the streets. The kids can get rid of some of their excess energy in Toontown. They can walk through the cheerful Chip 'n Dale's Treehouse, explore Donald Duck’s secret life as a boat’s captain at Donald's Boat, check out Goofy's house which is as ... goofy.. as he is, play on his furniture and bounce in the backyard at Goofy's Playhouse. Toontown’s most popular walk-through attraction is Mickey's House where the visit often ends with a character greeting. The lines can be long, and the wait may try your toddler’s patience. Minnie's House is also popular, and the cute furniture and kitchen are fun to see. Enchanted Tiki Room: You’ll find it near the Adventureland entrance, with the Dole Whip stand just outside. The show gives you a nice, cool place to sit for a few minutes to watch the show and listen to the birds sing. It gets a bit noisy near the end - and there's a simulated thunderstorm. Great Moments With Mr. Lincoln: You’ll find Mr. Lincoln on Main Street U.S.A., near the entrance. The kids may find it dull, but it's not scary, it's cool inside, and you get to sit down for a few minutes. Tarzan's Treehouse: You might not notice this attraction unless you look up as you’re on the way toward Pirates of the Caribbean, but it’s a fun short walk, and you can get some great views from the rope bridge at the top. There's some stair-climbing, and the bridge can be a little unsettling (but not unsafe) when it starts to sway. These rides allow children, but for various reasons may not be right for your little one. Alice in Wonderland is an indoor ride and dark most of the time, but gentle and subdued. One adult and two kids can manage this ride if they don't mind sitting in two rows. Autopia is one of Tomorrowland’s oldest rides, where kids can pretend to drive along a guided track. You have to be 52 inches or taller to drive, but anyone more than one-year-old can ride. It also has Rider Switch, which allows adult guests to take turns waiting with youngsters or other guests who are unable to ride. Some kids might not like the inevitable jostling when another car bumps you from behind. Buzz Lightyear Astro Blasters: Located near the Tomorrowland entrance across from Star Tours, Buzz Lightyear is like being inside a big video game. One adult and two kids can fit in the same vehicle, but only two can shoot. Finding Nemo Submarine Voyage: Going searching for Nemo's underwater world in a submarine is not for claustrophobic kids and anyone who hates sharks, but others who love the Pixar film will also love the ride. It’s in the Tomorrowland lagoon. Seating is bench style, and it’s easy for family groups to stay together. Gadget's Go Coaster is a small roller coaster is so gentle it's unlikely to scare anyone or make them nauseous, but it does have a 35-inch height limit. Haunted Mansion: It’s a New Orleans Square classic and a fun trip through a mansion taken over by a bunch of mostly friendly ghosts. It moves gently enough, but there's a lot of noise and thunder and evil laughs at the beginning - and ghosts inside. Two kids and an adult can fit into the same ride vehicle. The official name is Mad Tea Party, but most people just call this the spinning teacups, which says it all - not the best choice for anyone prone to motion sickness. The teacups are big enough to accommodate several people. You can get to its Fantasyland location by walking through the castle or taking the pathway to its right. Many Adventures of Winnie the Pooh is one of only two rides in Critter Country. You'd think Winnie would be gentle enough, and he is, but the ride is dark inside, and there's an exploding birthday cake. One adult and two kids can manage this ride together if they don't mind sitting in two rows. Matterhorn Bobsleds sits between Fantasyland and Tomorrowland. It’s an indoor roller coaster which goes fast and has lots of dips and turns. Kids taller than 35 inches and three years old can ride, but only with an adult. Some kids think the Abominable Snowman's glowing red eyes are frightening. Mr. Toad's Wild Ride is in Fantasyland, and it seems gentle from the outside, but think again. During your ride with Mr. Toad, you'll be hit by a train and sentenced to Hell It's all a bit much for some kids. One adult and two kids can manage this ride if they don't mind sitting in two rows. Peter Pan's Flight is one of Fantasyland’s most popular rides and almost always has a long wait. It’s a gentle flight over the city of London at night that's among everyone's favorites. The only concern would be for kids who are afraid of the dark. Pinocchio's Daring Journey: Like Snow White, this Fantasyland ride is true to the story, but Pinocchio's tale does have some frightening moments. Pirates of the Caribbean: Located in New Orleans Square, Pirates is a water ride in the dark with a couple of small drops. The parts that can scare little ones are when it passes through a simulated cannon battle and a town on fire. Seating is in rows in vehicles with several rows, making it easy for family groups to stay together. Roger Rabbit's Car Toon Spin: You’ll find Roger at the back of Toontown. Just like the character, it’s a busy and crazy ride in a runaway taxi that's a lot of fun, but it does have some loud noises. Snow White's Scary Adventures: The word "scary" in this Fantasyland ride's name is important. It sticks to the storyline, but that witch can be just plain old terrifying.